Snacking is a good habit provided its wisely chosen. Snacking bridges the energy requirement between main meals, fuel our body, balances blood sugar levels and make up for a part of daily’s nutrient requirement too. It is more harmful to avoid snacking to stay healthy. 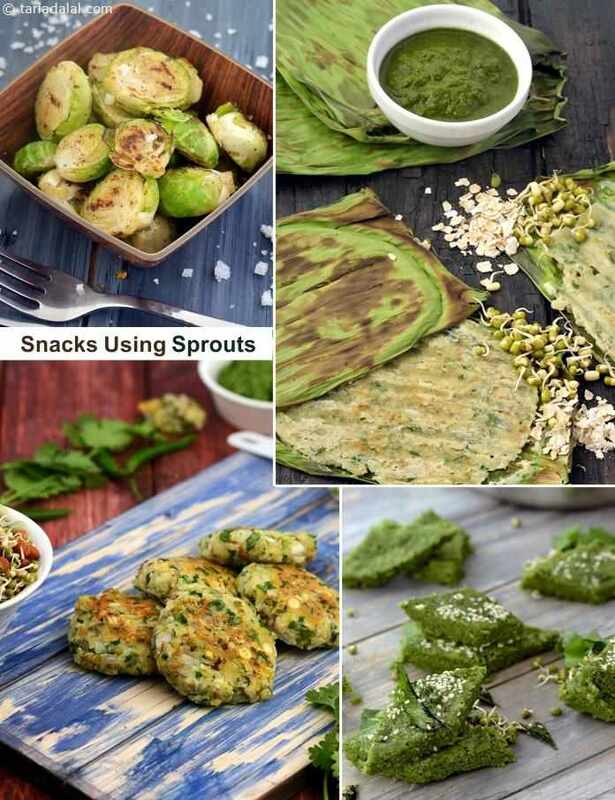 Scroll down the pages and find interesting snacks using sprouts like Methi and Moong Sprouts Wrap, Sprouts Pancakes, Sprouts Misal and many more…. IF you are one mangst those who don’t mind trying some interesting salads once or twice a week for snack, we have recipes for you too. Sprouts, Spring Onion and Tomato Salad, Mixed Sprouts Salad and Roasted Brussels Sprouts with Sea Salt. As an occasional treat, you can also try 1 to 2 pieces of Masaledar Mixed Sprouts Sandwich. Sprouts and vegetable salad, keep yourself satiated and full with this salad with a winning combination of sprouts and veggies. Sprouts are rich in iron and vitamin b-complex, making this a great weight loss salad. I’ve kept the preparation simple by adding coriander, lemon juice and pepper. A recipe put together in minutes if sprouts are handy. . . . . . I have chosen this recipe as sprouting increases the calcium content of pulses and also aid digestion. Serve it with whole wheat bread or rice.